(WASHINGTON, DC) March 19, 2019—The Corporation for Public Broadcasting (CPB) today presented the Community Lifeline Award to WUFT-TV/FM (WUFT) and the Florida Public Radio Emergency Network (FPREN) during a meeting of the CPB Board of Directors. The award recognizes public media stations providing outstanding service to their communities during local emergencies, natural disasters and other urgent situations. From left, CPB Board Chair Bruce Ramer, CPB Board member Robert Mandell, FPREN Chief Meteorologist Jeff Huffman, WUFT and FPREN Executive Director Randy Wright and CPB Board member Elizabeth Sembler. 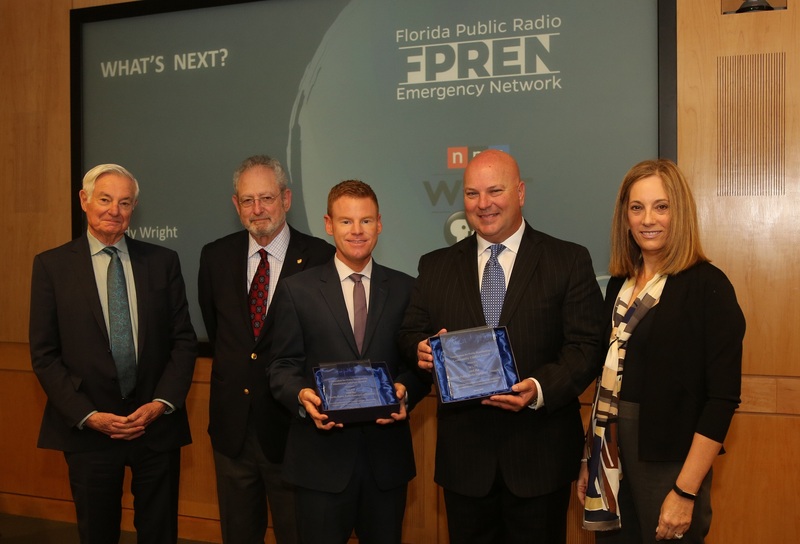 FPREN is the collaboration of 13 public radio stations based at WUFT in Gainesville-Ocala, Florida, and delivers emergency broadcast and social media content across the state. Their free app, Florida Storms, provides geotargeted live forecasts, information about evacuation routes and shelters, and live streams local public radio broadcasts. FPREN served millions of people through multiple emergencies including Hurricanes Michael, Irma and Matthew. “We’re honored by this recognition from CPB for what we feel is a core mission of public media. We appreciate the ongoing support of CPB, Pat Harrison and the Board for their encouragement of innovative concepts like FPREN and look forward to providing these public safety services to even more Americans in the future,” said Randy Wright, executive director of WUFT and FPREN. WUFT operates as a part of the University of Florida and incorporates hundreds of students annually from the UF College of Journalism and Communications into immersive professional experiences. WUFT also launched the South Carolina Emergency Information Network with South Carolina ETV/South Carolina Public Radio in 2018, serving South Carolina and parts of North Carolina with emergency messaging. Established in 2012, this is only the second time the Community Lifeline Award has been presented. The inaugural recipients were WNET and New York Public Radio (WNYC/NJPR). The Corporation for Public Broadcasting (CPB), a private, nonprofit corporation created by Congress in 1967, is the steward of the federal government’s investment in public broadcasting. It helps support the operations of more than 1,500 locally owned and operated public television and radio stations nationwide. CPB is also the largest single source of funding for research, technology and program development for public radio, television and related online services. This entry was posted in Press Coverage and tagged Award, Collaboration, CPB, Florida Public Radio Emergency Network, FPREN, UF, WUFT. Bookmark the permalink.